Full Crawl that re-crawls all documents from Content Source. Incremental Crawl that crawls documents modified since the previous one. But it is really not enough if you are working on search driven apps. (More about SharePoint crawling you can read in Brian Pendergrass “SP2010 Search *Explained: Crawling” post). Search applications are a special kind of applications that force you to be iterative. Generally, you work with large amount of data and you cannot afford to do full crawl often, because it is a slow process. There is another reason why it is slow: more intelligent search requires more time to indexing. We can not increase computations in query time, because it directly affects users’ satisfaction. Crawling time is the only place for intelligence. Custom document processing pipeline stages are tricky a bit. Generally, you can find some documents in your hundreds of thousands or millions corpus, which failed on your custom stage or were processed in a wrong way. These may happen because of anything (wrong URL format, corrupted file, locked document, lost connection, unusual encoding, too large file size, memory issue, BSOD on the crawling node, power outage and even due to the bug in the source code 🙂 ) Assume you were lucky to find documents where your customizations work wrong and even fix them. There is a question how to test your latest changes? Do you want to wait some days to check whether it works on these files or not? I think no… You probably want to have an ability to re-crawl some items and verify your changes. Incremental crawl does not solve the problem. It is really hard to find all files that you want to re-crawl and modify them somehow. Sometimes modification is not possible at all. What to do in such situation? 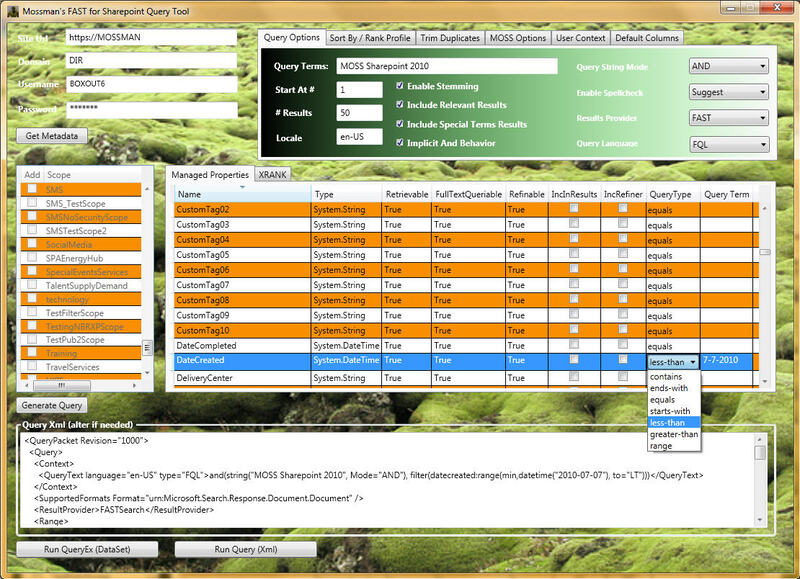 Search Service Applications have an UI for high level monitoring of index health (see the picture below). 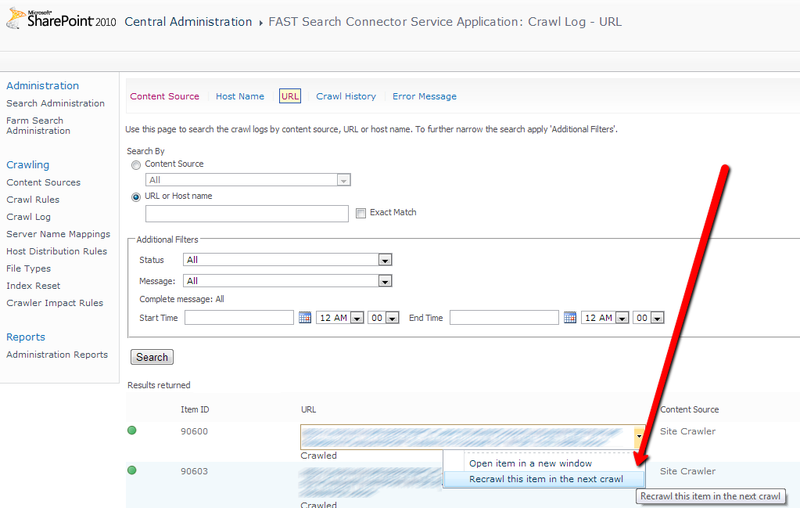 There you can check the crawl status of document by URL and even re-crawl on individual item. SharePoint does not provide an API to do it from code. All that we have is a single ASP.NET form in Central Administration. If you make a further research and catch call using Fiddler then you can find target code that process request. You can decompile SharePoint assemblies and find that some mysterious SQL Server stored procedure was called to add you document into processing queue (read more about that stuff in Mikael Svenson’s answer on FAST Search for SharePoint forum). Ahh… It is already hard enough, just a pain and no fun. Even if we find where to get or how to calculate all parameters to stored procedure, it does not solve all our problems. Also we need to find a way to collect all URLs of buggy documents that we want to re-crawl. It is possible to do so using SharePoint web services, I have already posted about that (see “F# and FAST Search for SharePoint 2010“). If you like this approach, please continue the research. I am tired here. You should be a bit familiar with Selenium, but this one is easy to fix. It will be slow. It works for hundreds document, maybe for thousands, but no more. ( I think that if you need to re-crawl millions of documents you can run a full crawl). It is easy to code and to use. It solves another problem – you can use Canopy for grabbing document URLs directly from the search result page or the other one. Be careful, Selenium, Canopy and web drivers are high intensively developed projects – newest versions maybe different from mentioned above. Now, we are ready to automate the behavior, but here is a little trick. To show up a menu we need to click on the area marked red on the screenshot below, but we should not touch the link inside this area. To click on the element in the specified position, we need to use Selenium advanced user interactions capabilities. click "#ctl00_PlaceHolderMain_UseAsExactMatch" // Select "Exact Match"
| _ -> failwith "Menu item does not found." click "#ctl00_PlaceHolderMain_RadioButton1" // Select "Url or Host name"
That is all. I think that all other parts should be easy to understand. Here, CSS selectors used to specify elements to interact with. Another one interesting part is grabbing URLs from search results page. It can be useful and it is easy to automate, let’s do it. Finally, we are ready to execute all this stuff. We need to specify two URLs: first one is to the page with search results where we get all URLs, second one is to the logviewer page in you Search Service Application in Central Administration(do not forget to replace them in the sample above). Almost all SharePoint web applications require authentication, you can pass your login and password directly in URL as it done in the sample above. If you are a SharePoint developer, an Enterprise Search developer or an employee of a large corporation with Global Search through private internal infrastructure then you may be interested in search automation. Deployment of FAST Search Server 2010 for SharePoint (F4SP) is out of the current post’s scope (you can follow TechNet F4SP Deployment Guide if you need). F# 3.0 comes with feature called “type providers” that helps you to simplify your life in daily routine. 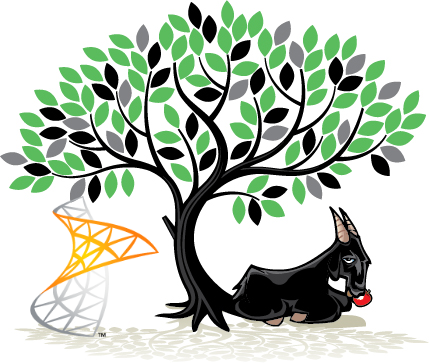 For the case of WCF, the Wsdl type provider allows us to automate the proxy generation. Here we need to note that, F# 3.0 works only on the .NET 4.0 and later, but SharePoint 2010 server side runs exclusively on the .NET 3.0 64bit. Let’s see how this works together. Firstly, we create an empty F# Script file. At this point, the type provider creates proxy classes in the background. The only thing we need to do is to configure the access security. The following code tested on the two SharePoint 2010 farms with NTLM authentication and HTTP/HTTPS access protocols. let service = new SharePointSearch.ServiceTypes. To query F4SP we use the same web service as for build-in SharePoint 2010 search, but with a bit different query XML. The last thing that we need to do is to build query.You can find query XML syntax on Microsoft.Search.Query Schema, but it is hard enough to work with it using official documentation. There is a very useful CodePlex project called FAST Search for Sharepoint MOSS 2010 Query Tool which provides a user-friendly query builder interface. FAST has its own query syntax(FQL Syntax) that can be directly used through SharePoint Search Web Service. FAST also supports native SharePoint Keyword Query Syntax. """"Functional Programming" scope:"Documents" (fileextension:"PPT" OR fileextension:"PPTX")"""
One of the principal differences between two syntaxes is that Keyword Query needs to be converted into FQL on the SharePoint side. Keyword syntax also supports scope conditions, which will be converted into FQL filters. For example “scope:”Documents”” will be translated into ” filter(and(isdocument:1))” (In the case when Documents scope exists in the SharePoint Query Service Application). Unfortunately, we can not specify SharePoint scope in FQL query. FAST for SharePoint 2010: How and Why?